Vendor of Fuel level sensor Eurosens Dominator RS is Mechatronics. 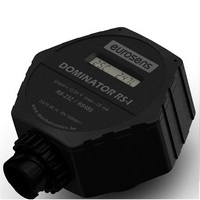 The fuel level sensor Eurosens Dominator RS of the capacitive type has at once 2 (two) digital RS-232 and RS-485 interfaces and one specialized automotive interface ISO 9141 (K-Line). Dominator fuel level sensors are designed to minimize the operating costs of fuel consumption monitoring system for the entire period of its operation. Powerful electronic module protection. External power voltage protection up to 170 volts. The modular design allows not only cut the sensor for a specific vessel, but also to extend the electrode. This is useful when you reinstall the system to another object. Sensors of traditional non-modular design can’t be extended and once shortened electrodes can’t be replaced. Easy sealing of the sensor from disconnection cable and sensor removal. The electrodes can be easily disassembled and cleaned. Sensors of conventional design can be contaminated in the gap between electrodes that require a complex maintenance. Dominator electrodes can be cleaned by the customer without warranty violations. The modular design makes it easy to provide technical support of installed sensors. We can easily localize the problem either in the sensor “head” or in sensor electrodes, because electrodes can be disconnected from sensor “head”. If the fault is in the “head” of the sensor – replacement can be done even by the end user – the owner of the equipment. Thanks to bayonette, a fast-lock replacement is very easy and takes about 10 minutes. It is much cheaper than travel costs of installation staff. After sensor “head” replacement, you don’t need to make a tank calibration again (unlike traditional design sensors). Warranty term – 5 years.